It’s a very busy morning on the farm. Farmer Barnes is away, so Charlie and Pop-Up have lots more chores to do than usual before the school bus arrives. With a little help from Dumpy and his animal pals, Charlie just might make it to school on time! 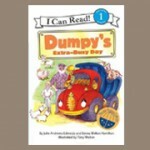 Dumpy demonstrates the rewards of cooperation in this lively easy-to-read book.